In these photos I have captured the last remains of summer here in Northern Norway. These flowers are from the calendula plant, also known as pot marigold. I was amazed how long these plants were able to survive. They were even flowering after some nights with frost. 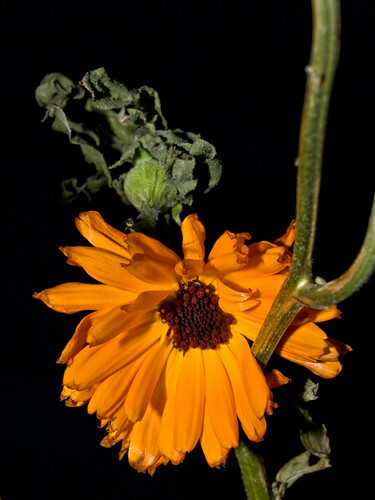 The first photo is of an orange calendula flower that look relatively fresh. Taken with Olympus E500 digital camera November 19th 2007. Click image for larger view. 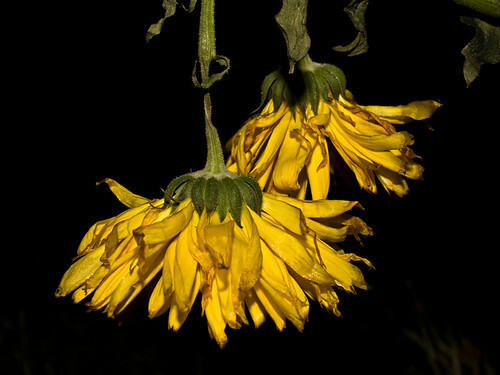 These yellow calendula flowers, though, look like they had to cave in for the colder season. Love those photos. My husband and I have been discussing a Norway visit and these photos just fuel the discussion. Brilliant. Great macro work here Thomas ! This is a complete new way of showing flowers. I loved it.